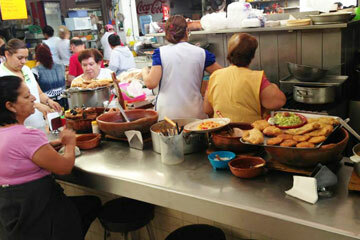 Raul Hernández is a huge fan of traditional Guadalajara cuisine and a blogger turned gastronomic guide. Hernández explains that he realizes most adventurous foreigners, with a standard guidebook and a little Spanish, can fare pretty well eating and drinking at places such as the cantinas on Chapultepec or even the vast San Juan de Dios market. But his tours generally venture beyond that, he says, and include less-known neighborhoods and varieties of food, and even almost-hidden cantinas that are more than 100 years old.